Who’s the Bozo Administering Your Retirement Plan? When you have a plumbing issue, you call in a qualified plumber, right? When you need a medical procedure, don’t you want a qualified doctor? When you go to get your car fixed, aren’t you going to hand it over to a qualified mechanic? So why would you turn your retirement plan over to an unqualified administrator? Wait! You didn’t know that you’ve placed your hard earned retirement money in the hands of someone who very likely doesn’t know what they’re doing? It’s one of the common retirement planning traps I’ve been covering in this blog. A study from the Center for Retirement Research at Boston College found that plan administrators choose mutual funds that lag far behind comparable indexes. Just like the rest of us humans, these plan administrators routinely chase returns. About the best thing the study would say was that, even though plan administrators choose funds that lag the indexes, at least their choices were better than randomly selected funds. Translation: Their choices were marginally better than a monkey throwing darts, or a using random-name generator to pick funds. Yet according to Towers Watson, a global financial consulting firm, 90% of all new hires let their plan administrator choose where their money will be invested for them! There’s no nice way to put this: Too many plan administrators don’t have a clue about what they’re doing. They just aren’t qualified to oversee your retirement plan and take good care of your funds. But what about those fancy, schmancy financial advisors and brokers they get investment advice from? Take a stab at this question: What percentage of mutual funds, professional financial advisors, and investment advisory services underperform the overall market and the benchmarks they track? Answer: About 80% of all mutual funds and 80% of all investment newsletters and professional advisors underperform the market over the long term, according to the Hulbert Financial Digest. And it’s not just because of the fees they charge. Are you wondering how that’s possible? It’s because experts are human, too, and are predictably irrational like all the rest of us, buying and selling at the wrong times. My husband, Larry, and I have had painful personal experience with this. We had invested in all sorts of financial products and vehicles starting in 1987, but we never came close to getting the returns we were told we should be able to get. At one point, we figured the problem must be us. You know how some people seem to be unlucky in love? Well, we seemed to be unlucky in investing. So we decided to hire an expert to manage our money for us. We ultimately hired three oh-so-pricey experts – and all three of them lost us money during what turned out to be the longest-running bull market in history! Is There a Better Retirement Planning Solution? In previous blog posts, I’ve mentioned a better alternative for your retirement savings: Bank On Yourself. How do conventional retirement plan administrators compare to how Bank On Yourself plans are administered? First of all, unlike financial advisors and Wall Street brokers, life insurance companies (the basis of Bank On Yourself) are strictly regulated via several layers of protection: They’re audited regularly by the state insurance commissioner’s office which has the right to take over and run the company in the interests of policyholders if the company gets into financial difficulty. And most insurance companies are audited regularly by several independent rating companies along with additional policy owner protections that are available on a state-by-state basis. In addition to these layers of protection, life insurance companies are simply run differently. Life insurance companies aren’t trying to grab short-term profits wherever they can. They operate more like a mom driving in the minivan full of kids, not a teenager showing off in a hot sports car. The mission of these insurance companies is to get you and your family to your destination safely. As for the companies specifically recommended by Bank On Yourself Authorized Advisors, the bulk of their portfolios is invested in investment-grade fixed-income assets. Their bond portfolios are highly diversified across many industries and companies, and typically no investment represents more than 1 percent of assets. Less than 1% to 2% is invested in U.S. Treasury or other government debt. These companies had virtually no exposure to the risky investments that caused the market meltdown of 2008. In fact, these companies have NEVER had a losing year in more than 160 years. Due to their financial strength and reserves, these companies have the ability to hold on to any assets that may decline in value for many years until those assets recover. If you’re tired of inept administration of your precious retirement funds, check out this article. Which of These 6 Costly Retirement Plan Pitfalls Are of Greatest Concern to You? 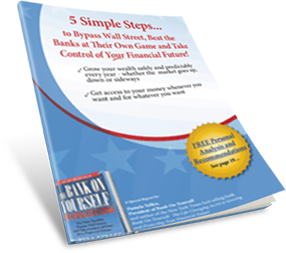 Free Report reveals a retirement planning alternative that comes with an unbeatable combination of benefits that include safety, guaranteed growth, liquidity, control and tax advantages. Download the Report for free right here.